There are four steps to a successful harvest: proper garden planning, timing when to pick, storing vegetables to keep them fresh, and choosing the right method to preserve the crop's flavour. We have put together some useful information on how to plan for a successful harvest, general harvesting guidelines, and how to store food in preparation for preserving. The main point behind growing your own vegetables is how much better they taste fresh from the garden. The only fail safe way to guarantee harvesting vegetables at the optimal time is to do the taste test. However, there are some guidelines for judging when vegetables are ripe and ready for harvest. Keep in mind that great flavour isn’t a simple matter of size or colour. There are no exact guidelines as to when to harvest your vegetables, but there are some rules of thumb to guide you. Most vegetables are harvested just before full maturity, for maximum flavor and the best texture. Harvest at the proper stage of maturity, not before. You can harvest most vegetables several times if you harvest only the part that is ready. Harvest on time. Harvest okra every 1 or 2 days. This also applies to summer squash, beans, and cucumbers. Harvest when the foliage is dry. Tramping through wet foliage spreads diseases. Don’t damage foliage by stepping on vines or breaking stems. This creates wounds and entrances for diseases. Don’t harvest when plants are wilted. Wounds made by harvesting permit water loss, which increases water stress inside the plant. 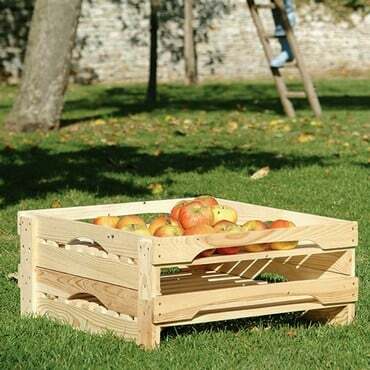 Immediately move freshly harvested vegetables into the shade and keep them cool. Use freshly harvested vegetables as soon after harvest as possible. Don’t injure the plant during harvest. Gently remove the part to be harvested from the plant. Cut eggplants and watermelons with a knife. Cut okra that won’t snap off. In general, try to harvest during the coolest part of the day - either early morning or late afternoon. Harvest when crops are dry. If you're harvesting a vegetable for fresh eating, pick it just before mealtime. This preserves its flavour and nutrients. The sugars in the vegetable start turning to starch within minutes of harvesting. Many vegetables should be picked young, when they're at their sweetest. As vegetables mature, their sugar turns to starch. Root crops can become bitter and woody if grown too large. Check days to maturity and expected root size of each variety to gauge the best time to pick root vegetables. With many vegetables, the more you pick, the more they'll produce. 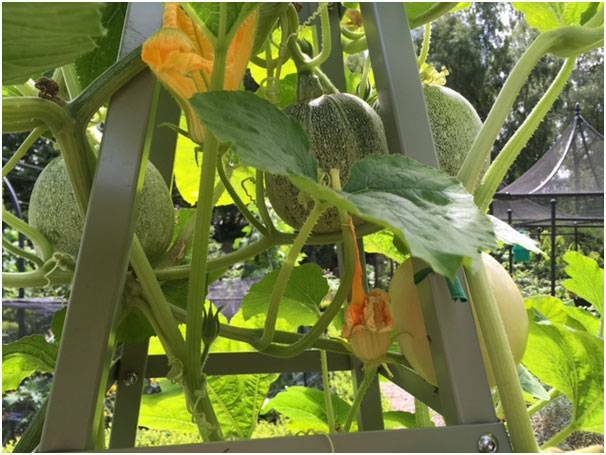 Fruiting vegetables such as cucumbers contain the seeds for the next generation. As soon as there are enough mature seeds, the plant gets the signal to stop producing fruit. If you keep picking the fruit while its seeds are still immature, the plant is tricked into thinking it needs to keep producing more fruit to propagate itself. Some crops should be harvested at maturity. Winter squash and tomatoes, for example, should be left to ripen on the vine. Some vegetables, such as carrots, can be harvested at any stage. When the heat of summer hits, the natural tendency of cool-weather crops such as flowering brassicas and leafy greens is to reproduce and go to seed, or bolt. Pick these vegetables before they bolt and become bitter or otherwise unusable. The only way to experience vegetables at their prime is to grow them yourself. For best results, harvest your vegetables the day you plan to eat them, preferably early in the morning. Sprinkle them lightly with water and store them in a cool place until you're ready to prepare them. Some vegetables, such as parsnips, carrots and potatoes, keep well in the ground until needed. Others have a short harvest window and should be picked promptly when ripe. The first step to a successful harvest is to plan your garden. Determine the desired yield for each vegetable. Don't grow more than you and your family - and friends and neighbours - can eat. The second step also starts at the planning stage. Choose several varieties of the same vegetable that mature at different times. Plant early, midseason, and late season varieties of tomatoes, for example, to stagger the harvest. This not only provides you with fresh tomatoes throughout the growing season, but it keeps you from having more tomatoes than you can eat, process, or give away at any given time. Successive plantings of a single crop can accomplish the same purpose: for example, planting a row of lettuce every two to three weeks. Another option is to select varieties that bear over a long period of time rather than all at once, such as beans. Finding a place to store all your produce during the peak harvesting season can be a challenge. Most vegetables, with the exception of tomatoes, can be refrigerated for a short period of time before processing. A cooler or other insulated container filled with ice is a good temporary option if your refrigerator is full. Keep your freezer well-stocked with ice - either cubes or water-filled plastic containers with screw-top lids - to use for this purpose. With a little knowledge and planning, you can make your life a lot easier at harvest time! How can you make your homegrown vegetables last longer? The last thing you want after all your efforts is your yearly carrot consumption to be squeezed into an overloaded fortnight, or your cucumbers to rot before you pick them. Well, here’s some good news: storing vegetables wisely can make their ‘use-by’ date much longer. This is an easy and inexpensive way to preserve and store vegetables. Onions, garlic, and hot peppers are usually dried. Winter squash, potatoes, and other root crops are best kept in cold storage in the traditional way of storing veg, in hessian vegetable Sacks. These have the essential ability to let stored crops breathe and air to circulate - a trait plastic sacks don't possess - helping to prevent disease outbreaks and keeping vegetables in tip-top condition for much longer. Storage spaces in the home can approximate old-fashioned cellars. Your 'root cellar' should be a cool, dry, dark space, such as a cool cupboard, basement, or garage. Optimal cold storage temperatures are 45°-50°F (7°-10°C). The best storing vegetables for root cellaring are beets, carrots, parsnips, potatoes, pumpkins, rutabagas (swedes), turnips, and winter squash. As a type of cold storage, some vegetables store well packed in layers of damp sand or sawdust in wooden boxes, crocks, or plastic buckets. Beets, carrots, parsnips and turnips can be preserved this way. Place boxes where they will be stored - they've heavy when full - and alternate layers of vegetables and layers of damp sand. Plant vegetable varieties bred for winter keeping. Don't wash vegetables before putting into cold storage - use a brush to remove soil. Cut tops off root vegetables. Check vegetables in cold storage frequently and remove any that are spoiled. 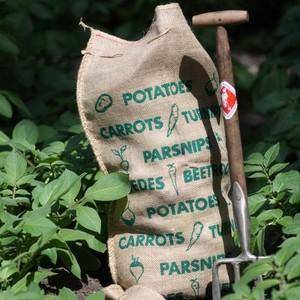 Some vegetables - including beets, carrots, parsnips and turnips - can be left in the ground until you want to use them. Cover with a 1-2 foot (30-60 cm) layer of mulch such as straw or hay, which will trap air and won't become saturated with water, an easy way of storing vegetables. You can also use wood chips or leaves if you remove them before they decompose in the spring. 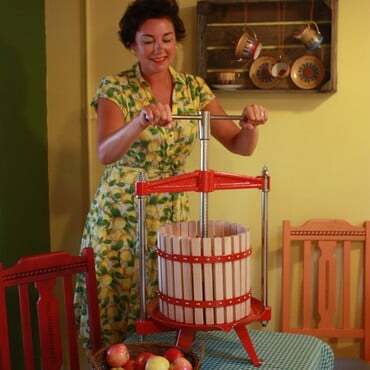 Apple presses produce delicious juice for instant drinking, cider-making, or freezing - you just won't believe how quickly and easily the apple press - along with a helping hand from the fruit crusher - turn apples or pears into juice! 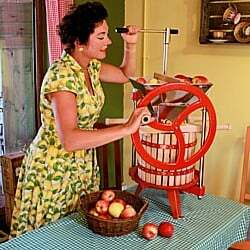 Fruit pressing and fruit crushing is a process rich in history, with the production of apple juice and cider stretching way back to Norman times. But things have moved on a bit since then and now pressing your own fruit at home could not be easier. Our range of fruit presses are incredibly simple to use and come with a comprehensive instruction booklet to get you started. Making jam and preserves from home grown fruit and vegetables used be a necessity in the days when fridges and freezers were unheard of, and this traditional pursuit - typical of the way the kitchen and garden work together - is now enjoying something of a boom. 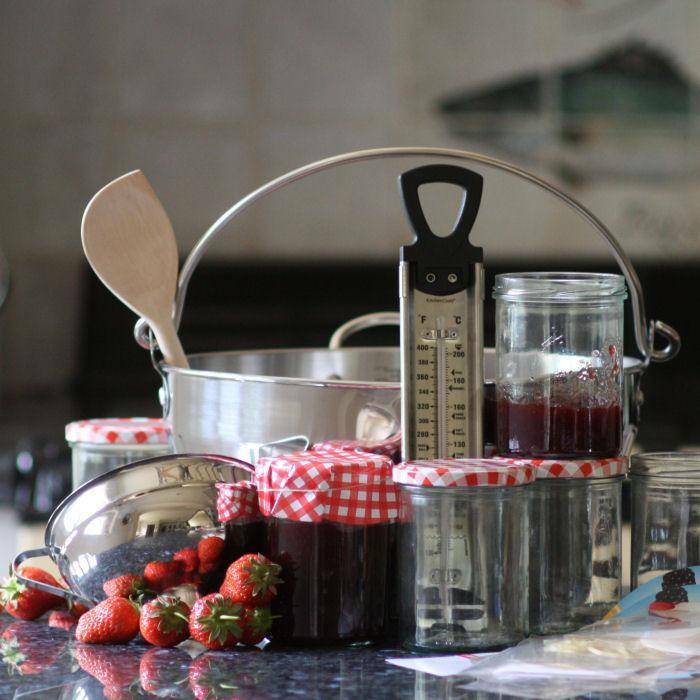 We've managed to find just the right 'blend' of high quality jam making equipment to help start you on the road to making your own jam, chutneys and preserves in the way you like them, with fruit and vegetables grown in your own garden. So say goodbye to mass-produced supermarket jams and preserves and start producing your own unique accompaniments to meals using your own produce and our range of kits, maslin pans, kilner jars, utensils and much more; your taste buds will certainly thank you for it! Freezing is a fast, easy way to preserve the vegetables you've grown in your garden. You can chop and freeze vegetables to have ready to add to soups or stews. Freezing vegetables is easy, and in most cases you don't need special freezing equipment. If you're pressed for time, tray freezing is a quick alternative to traditional freezing methods. Wash and dry the vegetables, cut them up and spread them out in a shallow pan and freeze. Once they're frozen, pour them into freezer bags and keep as per other frozen vegetables. Use within 2 months, preferably in sauces or stews.